Topic: Full Auto Glock Conversion For Sale On Amazon?! 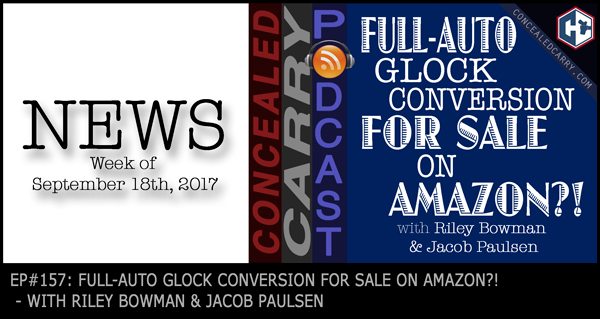 Riley and Jacob are back at it again discussing the most recent gun industry, gun rights and self-defense stories from across the U.S. Don't miss today's stories about illegal contraband for sale on Amazon, specifically Glock full-auto conversion kits. Although the listing is gone now, was this a setup from the ATF? We also talk about the exciting news of the SHARE Act, the latest suppressor deregulation bill, making it through committee and possibly heading for a votePlus 4 excellent JUSTIFIED stories that there's a lot to learn from. Hit the ‘PLAY' button and listen in now!! Looking To Make Your Glock Full Auto? Amazon Has An ILLEGAL Full Auto Conversion. DO NOT BUY.